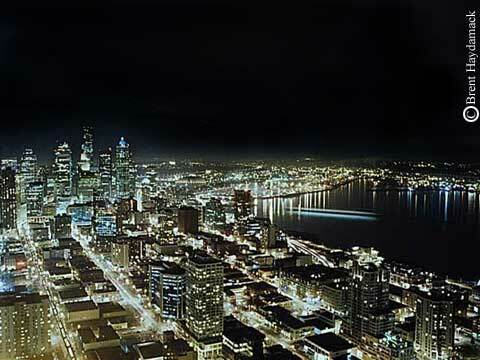 My initial suspicions of Seattle were only confirmed and further exacerbated by desperate news crews in December 1999 during Seattle’s brief contentions with the "Evil" WTO. As the networks covered the protests, violence, and chaos in the damp Seattle streets, they attempted to put a finger on the city; to label it with a few choice adjectives that might help the viewers understand their visual surroundings. Most of the descriptions and modifiers were correct in an elementary sense. A visit to any of the city’s 100 or more coffee shops can confirm the "Latte Land" label Seattle earned a long time ago. For comparison: the city of Seattle (proper) has less than 20% (536,978) of the residents of Phoenix’s entire Metropolitan area (2,931,004), yet it holds twice as many coffee shops. However, rainfall in the scientific sense isn’t that big of a deal in Seattle. In a ranking of 277 cities on weatherpages.com, Seattle comes in 120th, even being beat by sunny Miami (#19). Oh sure, it might seem like it rains all the time, but gray skies don’t necessarily mean rain. It’s just gray an awful lot in Seattle. Which is why I took note once I walked into a coffee establishment on a dingy Saturday afternoon and found that there wasn’t an empty seat in the house. The Seattleites had escaped the confines of their abodes and were all busy reading their newspapers, journals, books, magazines, espresso-machine manuals, whatever (I think they read to escape to some magical sunny land and even a Whirlpool/Kenmore Dryer Repair Book can provide some sanctuary). Most of them were wearing spectacles and fleece vests in a variety of subdued colors. Nothing too fancy – wouldn’t want to make themselves stand out, I presume. It’s all about blending in with your surroundings, I’m told by a local. Some of these things might confirm the stereotypes and practical adjectives tossed out there by CNN, but what they don’t cover is the attitude and personality of Seattle and its people. Largely a city of quaint innocence, Seattle is fishing-village-like in its appearance. Some houses are painted chili-pepper red or Grimace Purple to add a hint of color to an otherwise lifeless landscape. Basic White is delicately draped with multi-colored x-mas lights all year ’round. The cherry tree on the corner has its branches wrapped in little white lights and dainty red bulbs to accentuate its natural beauty. This is a place for the open-minded; for the folks who are ready for the "Last Call." Genuine smiles and helpful advice were passed about during merchant transactions and pub visits. One young man took the time to explain the subtle differences amongst three amber ales, the likes of which I had never seen. He provided a sample of all three and took on the effort of explaining the intricacies of each. While this may seem like plain customer service to some, I assure you that I, as a frequent pub-goer, have not seen much of this sincere, caring assistance in quite some time. Downtown Seattle seems to be chock full of youngsters, although the city itself has a median age of 37, a tad above the national median of 35. However, there’s a presence of youthful vigor in this city, as Seattle tries to shake off its long history of only being a port city. In the mean time, it tries to identify itself as something other than a latté-infested, rain soaked, dreary town with a gigantic architectural phallic symbol to act as a beacon to tourists who witnessed Seattle’s "treasures" during some sappy movie starring the quintessential romantic comedy duo of Tom Hanks and Meg Ryan. There is an entire Arts Community here that could benefit from some exploration and investigation. A slew of writers, musicians, painters, sculptors, and philosophers struggle madly to share their talents with the world. They’re everywhere in the streets, and in their symbolic forms of self-expression you might find some with wiry facial hair that looks more like a creosote bush than a beard. A brief scan through the local publications tells me that Seattle has more to offer than my hometown of Phoenix in the realm of art. At least two dozen plays are available in February. However, Dr. Demento is also making an appearance in the early months, so I’ll leave it at that (I thought – hoped? – he was dead). This city is different, for sure. 40-year-olds work as Sound Engineers for teenage rock bands, skating around on thin ice with no retirement money yet, and no veritable concerns for saving any. 20-somethings and 30-somethings alike wander about, relishing in the glow of freedom, for Seattle is a liberal town and if you don’t have a career picked out by 35 (we’re not all Bill Gates), it’s no big deal. That’s what it’s all about though, isn’t it? As Seattle finds itself, its citizens do the very same. A few conversations with the locals tell me this: it rains here all the time. Don’t move here. They don’t want the place infused with Californians who need a retreat from the smog-laden likes of Los Angeles. Seattleites like their town and they’re quite pleased with the fact that they are the hippest locale in the Pacific Northwest. Birth of Grunge, birth of Starbucks, whatever. Seattle still has some of the most interesting people around, and that’s what makes it a Great American City.